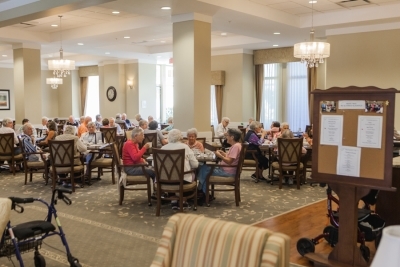 Our Pitt Meadows retirement home, known as The Wesbrooke, takes senior living to another level. We uphold a high standard in everything we do and our spirit of serve is always apparent. Dining is another aspect of our retirement home that offers an enjoyable experience for residents. Our elegant main dining area is designed beautifully make your dining experience pleasant. For those who need additional assistance, we have meal reminders, escorting to meals, and meal trays available. Are you interested in learning more about our dining options? Contact us at (604) 460-7006 to request additional information or a free consultation today! You will have everything you need and want at The Wesbrooke. We make a first impression that lasts. We offer safe and secure living. The Wesbrooke is designed for comfort and style. Schedule a tour today!